I started this box some time ago. The oak came from a tree that was take down on the site of the museum that I used to volunteer at. It was all riven and worked into the box sides while it was still green. After it had dried a bit, the joinery was cut and the front panel was carved. I assembled the box sides during a volunteer day at the museum and then it got put aside. I finally got around to finishing the box over the weekend. At this point, all it needs is a bit of final scraping in a couple spots and a good coat or three of oil. Then it will be listed for sale. 17th century style carved oak box in the white. 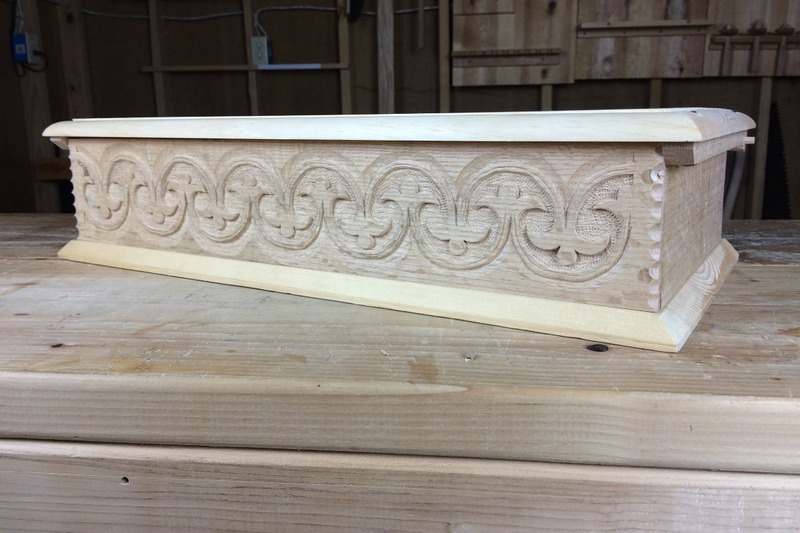 Posted in Project Logs and tagged bible box, carved box.